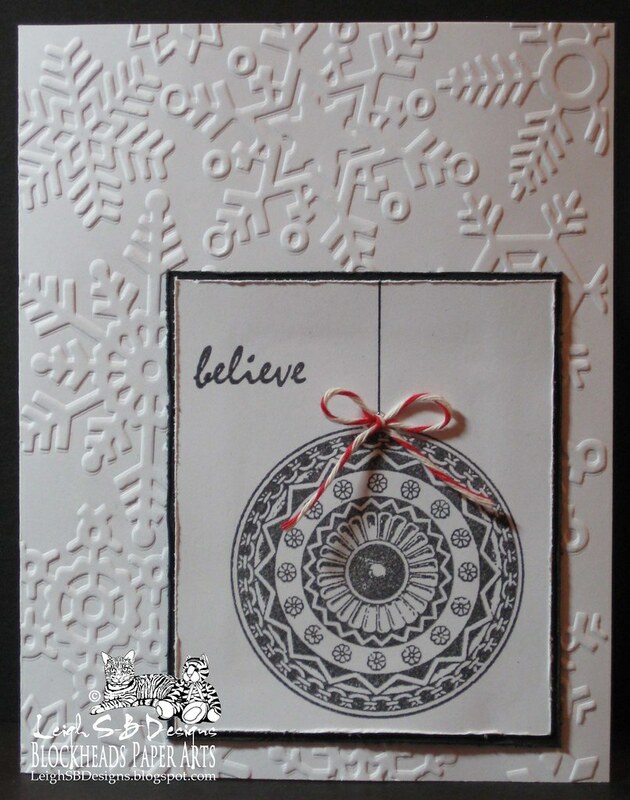 Velvet Paw Creations: "Believe in Christmas" CAS #2 for Blockheads Paper Arts! 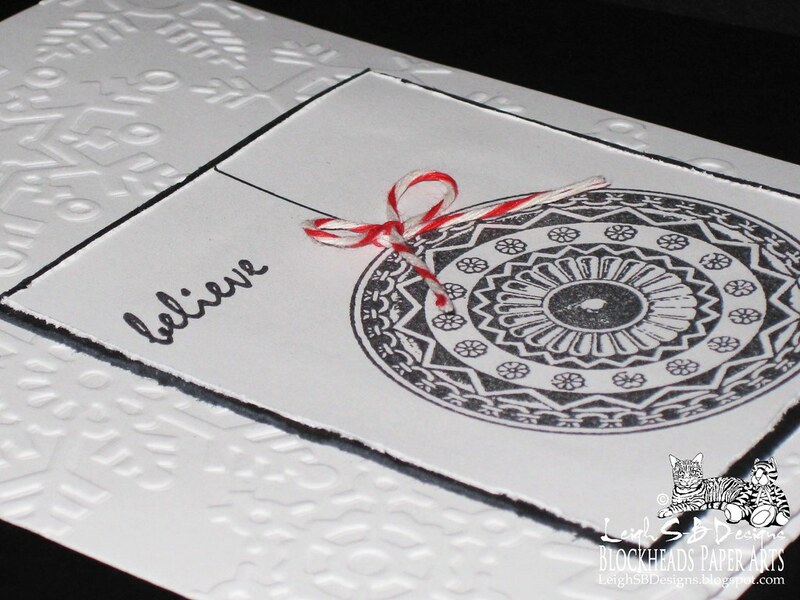 "Believe in Christmas" CAS #2 for Blockheads Paper Arts! Christmas is fast approaching and if you say every year that you want to make all your cards months in advance and end up rushing at the last minute then here's the perfect solution for you! Create some Clean and Simple cards that are quick to make, super fun and very elegant too! Here's my second Clean and Simple project for Blockheads Paper Arts current Technique Challenge! If you missed my first CAS card, which is the taller one, you can click on the photo above to go to that post. For more info on the Blockheads Technique Challenge please visit Karen's fab CAS Tutorial and check out my fellow design team mates projects as well as all the wonderful entries we've received so far by clicking on the thumbnail photos in the inlinkz collection below my project for today! The challenge ends on Nov 21 so you've got just over a week to create and enter for a chance to win two awesome prizes. Details below! 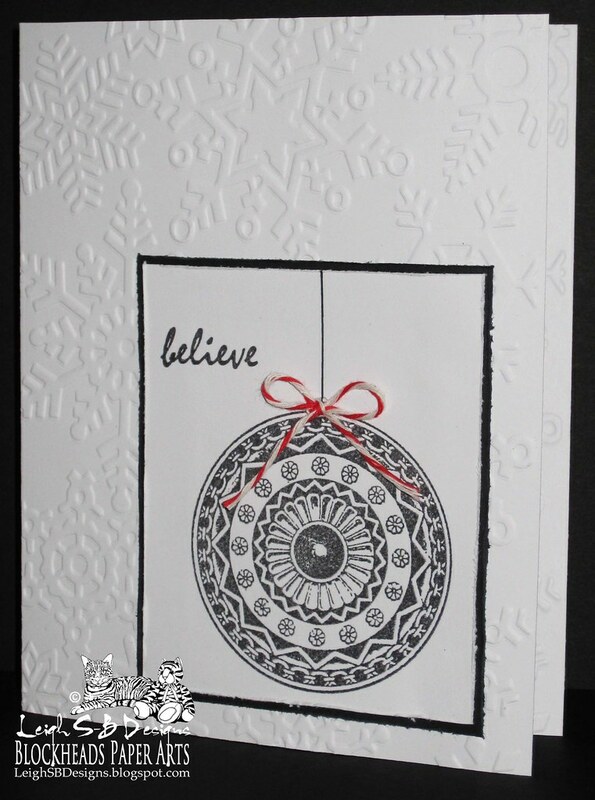 I used the same Blockheads medallion stamp from their Ancient Ornaments set and the lower case word 'believe' from the Verses full sheet for my design and stamped both in Tuxedo Black Memento ink onto white cardstock. I drew in the line with a Copic Multiliner to turn the medallion into a hanging Christmas tree bauble. This time I cut down the panel and distressed the edges with Tim's paper distresser tool and layered it onto a black mat. 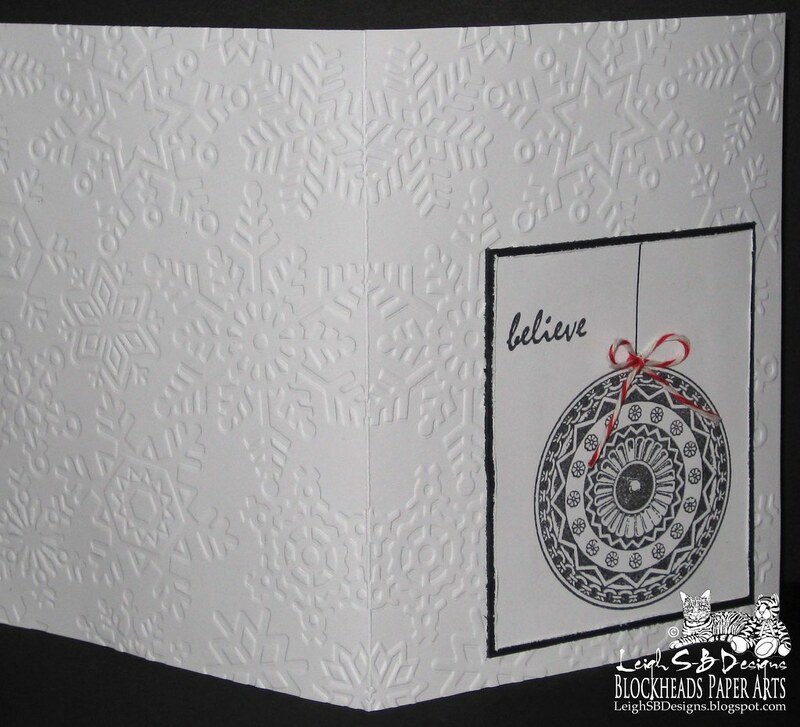 I embossed an entire white folded card, front and back, with a snowflake design from Cuttlebug's Winter Wonderland embossing folder set and adhered the panel to the lower right hand corner. For the finishing touch I added a bow made from red/white baker's twine for a dash of festive colour. I hope you'll come and play with us over at Blockheads Paper Arts for the chance to win two awesome prizes! You can enter the Blockheads Blog Hop part of the challenge and be in the running for a $25 gift certificate to their onlline store or share your creations on their Facebook page for the chance to win a 4 x 5.25 inch stamp set of your choice! Check out all the details HERE and you can submit your entry into the blog hop by adding it to the inlinkz collection below or on the Blockheads blog! That embossing adds a great touch, Leigh!